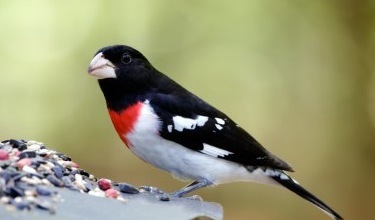 Usually only seeing one pair, today we spotted five male red-breasted grosbeaks and two females at the platform feeders. Hummingbirds and cat birds are back, several indigo buntings (the other bluebirds) are hanging around, and we managed a fleeting glimpse of a Baltimore oriole today too. With spring migrations upon us it’s an awesome time to catch some new visitors… vivid colors abound in the landscape if you happen to be feeding birds right now. If you’re not- it’s a primo time to start! Offering a variety of food like fruit and jelly and fresh water affords the opportunity for migratory birds to take up residence at your place and maybe even decide to nest there. This may require a few additional feeders, but you can be crafty here and fashion non-traditional items to use as feeders. A hanging glass candle holder makes a great jelly feeder, and there’s even an orange feeder for orioles made from a wire coat hanger. The “how to” is floating around the web somewhere! Fresh water works great in a simple plant saucer, and very shallow is always best for birds’ safety. 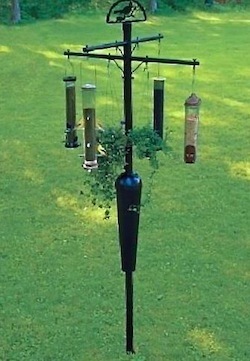 It features four arms with eight sturdy hooks to hang any kind of feeder, even a birdbath too! Especially if your yard is small, you’ll be able to maximize with a variety of treats for feat hered friends. If you’re new to the backyard birding scene, or know someone who is (hint: Mother’s Day), this complete bird feeder bracket system gets you up and running immediately! 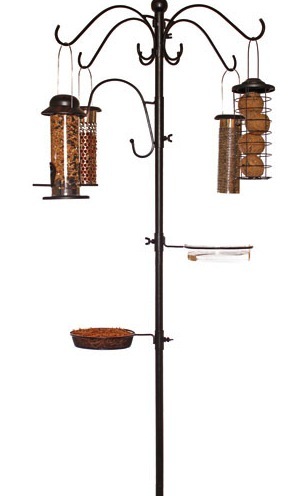 It comes with four basic feeders offering seed, peanuts, thistle and suet. That’s a fantastic mix to attract a wide variety of birds. The water dish promises to be a big hit, and the mesh tray is always open for options! 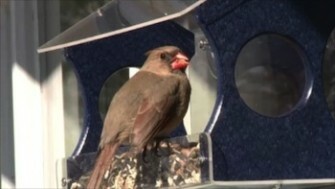 Live or dried mealworms, fruit, even a cup of jelly for catbirds and orioles. The only drawback is no baffle… we’d highly suggest using one to save your sanity and your bird food should squirrels abound in your yard! New Recycled Window Bird Feeders Rock! For Earth Day, we chose to feature new and green together. Not quite green in color, the vibrant primary hues make them that much more fun. So what’s so great about our new window bird feeders that’s worth mentioning? They help keep plastics out of landfills. Back in the day, when our very first poly-lumber (an industry term for recycled plastic) feeders arrived, they had stickers on the roof saying 33 milk jugs were used to make that item. I think the sticker’s still on one of the walls somewhere? Although one feeder may not have much of an impact, when thousands are purchased by consumers… it most certainly makes a difference. 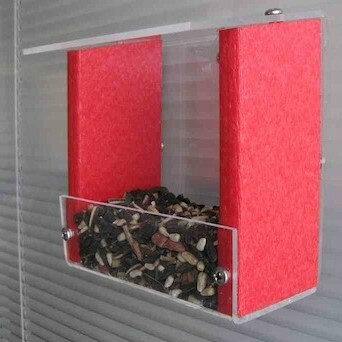 You can attract wild birds in the smallest of spaces with window feeders. The huge yard and landscaping isn’t required. On the balcony or deck, birds will visit your feeders. A shallow pan of fresh water is a good idea, and only helps further entice them. Recycled plastic (glass and ceramic too) are actually healthier for birds! The non-porous surface thwarts bacteria and mold from settling into crevices. Don’t get us wrong… wood is good, but the slick, smooth surface is much easier to clean and maintain as it resists bacteria that’s harmful to birds. Will never rot, split, fade, peel, crack or warp! Poly-lumber items are guaranteed by most manufacturers. Color won’t fade as it’s solid all the way through, no top-coatings to chip away over time. The material is so durable, products are guaranteed to never peel, warp, fade, rot, split or crack – pretty impressive really! 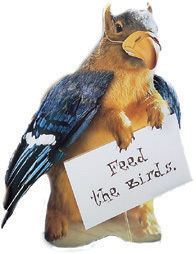 Offer birds a variety of treats throughout the year and see who visits? 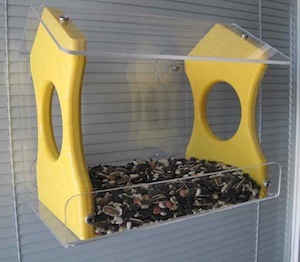 The open dish design of these feeders will not limit you to offering birdseed. Suet and crumbles, shelled peanuts, fruit, jelly placed in a small cup (for orioles, cat birds and woodpeckers), and even mealworms will entice a wide variety of visitors. 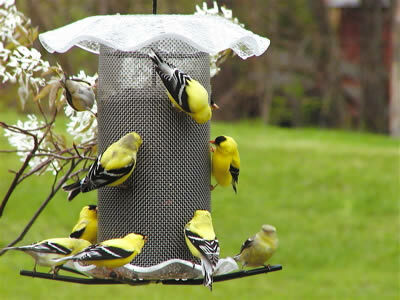 Offer specialty items in summer for migratory birds, and your basic seed and suet in winter for resident friends. With spring in the air, we spotted a pair of Indigo Buntings yesterday, and Mr. & Mrs. Red-Breasted Grosbeak today! So there’s a few good reasons why we think these window feeders are fab, plus they’re bird-tested and bird-approved. To welcome spring and help out Mother Earth, consider a new birdhouse or feeder for your feathered friends… the rewards are well worth the endless hours of entertainment they’ll provide. Happy Earth Day and thanks for feeding the birds! Eco Hummingbird Feeders for Earth Day Give-Away! There’s some awesome eco-friendly birdhouses and feeders out there, and with vibrant colors and fun designs-they’re made to last! To help celebrate and honor Earth Day (which should really be everyday), our friends over at A Lucky Ladybug are giving away one of our recycled art glass hummingbird feeders. Since somebody has to win… it’s definitely worth a shot entering! 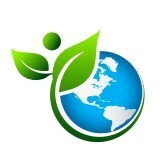 The contest starts on Earth Day, Tuesday 22nd. Do you have yours out yet? It’s time, it’s time! Because once again spring is late, many of the flowers hummingbirds naturally feed from aren’t yet available, nor are the insects on which they feast. After such a long journey over the gulf, the tiny sprites are hungry and tired… they need food to re-fuel for the continued journey North. Here’s the Ruby-Throated migration status according to sightings reported to hummingbirds.net… see? It’s time! If you start seeing hummingbirds and then you don’t, they may already be nesting, regardless of weather. Mother Nature gives them some serious hard wiring. For example, that crazy fighting over feeders-even when there’s plenty for everybody. It’s not just territorial. Their survival instincts are so strong, that claiming a particular hummingbird feeder is actually a matter of life or death for them! So get your feeders out of storage and first give them a good cleaning. Warm soapy water and a thorough rinse does the trick. Mix up a batch of nectar (consider making your own this year-it’s so simple). The solution can be made a bit stronger during migration periods as extra calories are helpful… especially when natural food sources are scarce. With smaller feeders, be sure to watch nectar levels so they don’t run dry, and do keep nectar fresh, changing it every few days. If hummingbirds come across spoiled nectar… they may not return to that feeder later. Oh yeah, and don’t forget to head on over to A Lucky Ladybug on Earth Day (Tuesday, 4/22) and enter the Give-Away! 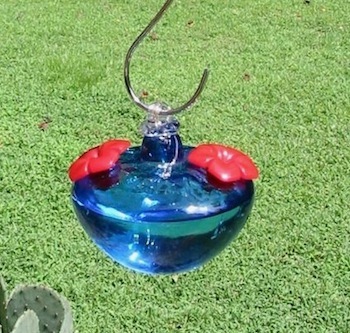 This 16-ounce capacity glass hummingbird feeder, complete with red Parasol ant moat and nectar could be yours… for many seasons of use by tiny sprites! Last winter a water problem was discovered in the crawlspace. Ground water was coming up pretty high and slowly rotting out the support beams. First thought to be a lack of ventilation – but it turns out this had been a longstanding problem. Over the summer a sump pit was dug, a pump and float switch added, and drain hose was run outside, across the side yard. 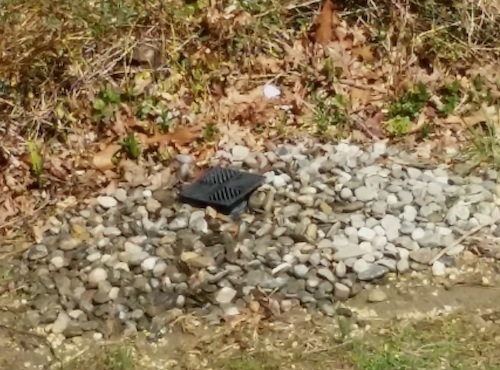 A simple outlet was created with gravel. It pumped all winter long, even during snowy weather, and is pumping right now. The water pools around the gravel and ultimately sinks into the ground. Flocks of resident birds gathered there all winter, particularly during really cold weather. While this is near the bird feeders, there were many birds (like robins) who don’t typically use them. Every time the pump ran, birds would swoop down and take a dip, or drink, and otherwise frolic in the temporary pond. Leaning towards burying a bird bath or some kind of large shallow form near there for summer so the water will be able to pool longer. This is clean, filtered ground water, it flows so it doesn’t freeze, and will be cooler in summer months. The best thing… it’s going to good use for the birds! Can You Spot the Thistle Feeders? Me neither as they must be covered in snow and awaiting the big thaw. So this is April? Wisconsin, Minnesota, somewhere like that. Goldfinches are already shedding worn winter feathers and turning yellow, while other common resident birds are nesting in much of the country. Once again, will winter ever end? Yesterday brought our first butterfly to the yard, but unfortunately the consecutive, way below normal night temperature this year zapped established lantana that was seven years old. You could always count on butterflies around those shrubs. Yes, that’s how big they were, mature shrubs. Erratic weather is largely attributed to climate change, but many folks don’t see it that way. Mudslides, volcanoes, drought and rising sea levels to name a few effects are pretty apparent and scarily becoming the norm. In the bluebird world, trail monitors found a record number of dead bluebirds in the KY area. A very late spring being the culprit after such a rough winter… there were simply no natural food sources available. Someone was inquiring about a feeder the other day and said “no rush, it’s for next year, we don’t really feed birds in summer”. We’ve come across many folks like that, but here’s the reality: weather directly affects food sources and bird’s survival rates. Last summer through a wicked drought, we witnessed a male cardinal feeding a fledgeling from a platform feeder containing sunflower hearts. From ground to platform and back he flew feeding his offspring. 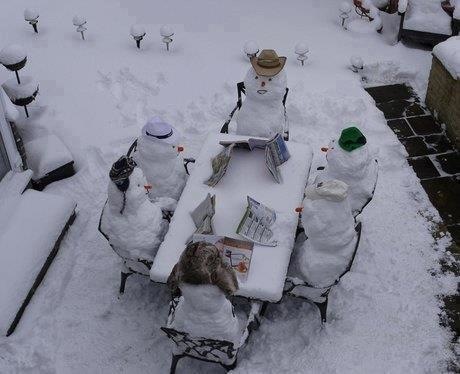 It was a strange sight, as others were reported this winter too. Cardinals hanging on suet feeders, and ground-feeding juncos up at black oil feeders. Many of the migratory birds were in for a harsh surprise upon arrival into the gulf states. No flowers, no berries, no insects, simply an equation for starvation after a long journey like that. Closer to home, resident birds braved a very tough season as well. Feeders were non-stop with activity for the most part. Although thistle feeders didn’t see too much traffic, other feeders containing finch mixes did… and a lot! Once the olive drab fliers began their molting process, straight nyjer became goldfinches’ food of choice and overnight, thistle was and is being devoured daily! The good news is this seed has come down in price a little bit, and if you can manage the larger bags, like 20-to 40-pounders, you’ll save even more money this summer. Unlike other birds, goldfinches feed nestlings and fledgelings thistle-almost exclusively. So if you’re not really a “summer feeder”, you may want to rethink maybe just one or two feeders this summer… the bird families sure will thank you! Take your hummingbird feeders a step further by helping Audubon track the tiny sprites this season. All habitats and feeders are welcome; from the old bird brain hummingbird feeders to honeysuckle and trumpet vine to colorful annuals providing food…. watch near fountains too, another favorite of this flying jewel! NEW YORK, NY (April 1, 2014) – With spring officially upon us, the National Audubon Society invites birders and nature enthusiasts across the country to help track the health of hummingbird populations with Audubon’s Hummingbirds at Home app. This citizen science project utilizes the power of volunteers to compile data at a scale that scientists could never accomplish alone. Every spring, numerous hummingbirds migrate long distances and must eat several times their weight in nectar daily to stay alive. Hummingbirds visit our yards every year, looking for nectar from our gardens and feeders. As flowers bloom earlier because of warming temperatures, the impact on hummingbirds which rely on nectar could be significant. The degree to which hummingbirds are able to adapt to accommodate these changes is not completely understood. Hummingbirds at Home was designed to bolster current research by collecting data from volunteers across the country that offers important insight on the effects of climate change and the birds’ well-being. 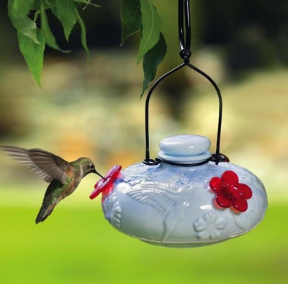 Hummingbirds at Home differs from other bird monitoring programs in that the focus is on recording the species, nectar sources, and feeding behavior observed. In the case of bloom timing mismatches, Audubon hopes to eventually learn if alternate nectar sources, like feeders, make a difference in hummingbird breeding success and survival. Participants can get involved by spending a few minutes as frequently as they wish to collect invaluable data from feeding areas in their gardens and communities. 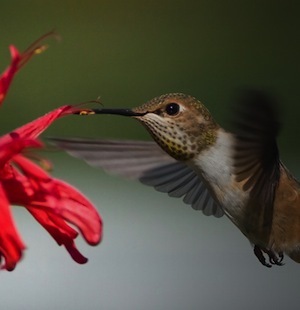 Audubon’s Hummingbird at Home app makes it fun and easy. There is no cost to participate and using the free mobile app or website makes it simple to report sightings and learn more about these remarkable birds. For more information visit, www.hummingbirdsathome.org. The National Audubon Society saves birds and their habitats throughout the Americas using science, advocacy, education and on-the-ground conservation. Audubon’s state programs, nature centers, chapters and partners have an unparalleled wingspan that reaches millions of people each year to inform, inspire and unite diverse communities in conservation action. Since 1905, Audubon’s vision has been a world in which people and wildlife thrive. Audubon is a nonprofit conservation organization. Learn more at www.audubon.org and @audubonsociety. Whose Eggs Are In Your Birdhouse? Did Ya Hang Your Hummingbird Feeders Yet?